And again some more Tech Death from UTP, those guy's really keep us updated in this genre. 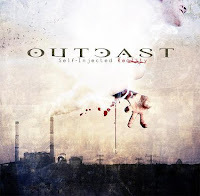 Outcast's Self Injected Reality is the follow-up of their debut from 2005. They also have released a demo under the name of 'Overlander'. 'Gojira, which came also from France, recently dropped a pretty unique record, Outcast's sound might has some influences from Gojira, but still is really original. Maybe imagine 'Cynic' would've played more Death on their Re-Union rcord, but for Outcast's sound, that are only influences, it's still working in it's own way. Gve their MySpace a try for two new tracks from their currenct album, if you dig the Genre. Your blog is so cool!! Please link to my rock blog.